(HOUSTON) Andre Johnson caught a screen pass from Matt Schaub and ran 48 yards for the winning touchdown in overtime as the Houston Texans rallied to beat Jacksonville 43-37 on Sunday. 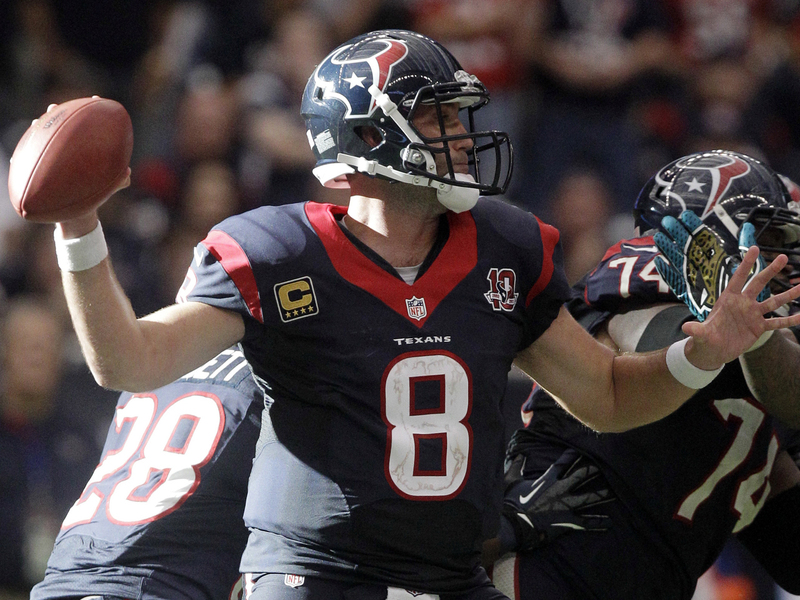 Schaub threw a career-high five touchdown passes, completed a franchise-record 43 passes and finished with 527 yards passing, second most in NFL history. Warren Moon also threw for 527 yards for the Houston Oilers in December 1990 against Kansas City. Norm Van Brocklin holds the record with 554 for the Rams in 1951. Johnson caught 14 passes for 273 yards, both career highs. The Texans (9-1) won an overtime game for the first time at Reliant Stadium. Chad Henne threw a career-high four touchdown passes in relief of injured Blaine Gabbert for the Jaguars (1-9). Rookie Justin Blackmon had 236 yards receiving. (ATLANTA) Matt Ryan overcame a career-worst five interceptions, guiding Atlanta to its only offensive touchdown in the fourth quarter in a sloppy win. The Falcons (9-1) turned it over a total of six times, but Michael Turner scored on a 1-yard run with 6:40 remaining to give Atlanta its first lead of the game. Ryan set up the score with four completions for 64 yards, including a 9-yarder to Tony Gonzalez on third-and-5 at the Arizona 10. Coming off a bye, Arizona (4-6) lost its sixth straight game. The Cardinals tried to bolster their anemic offense by switching quarterbacks, replacing John Skelton with rookie Ryan Lindley, but Larry Fitzgerald couldn't hang on to a fourth-down pass after Ryan's fifth pick. (DETROIT) Aaron Rodgers threw two touchdown passes, including a 22-yarder to Randall Cobb with 1:55 left to lift Green Bay. Mason Crosby made a 39-yard field goal with 19 seconds to go after missing two field goals earlier in the game. Matthew Stafford couldn't put the Lions ahead on either of their last two drives in a game he'd like to forget. Stafford threw two interceptions  one of which was returned 72 yards by Green Bay safety M.D. Jennings for a go-ahead score in the third quarter  and lost a fumble. Green Bay (7-3) has won five straight and Detroit (4-6) has dropped two in a row. (ARLINGTON, Texas) Dan Bailey kicked a 38-yard field goal in overtime and Dallas overcame a critical fumble by Tony Romo that sparked a wild ending. Bailey's winning kick with 6:07 remaining in OT came after both teams punted once in the first overtime game at Cowboys Stadium. Bailey hit a tying 32-yard field goal with 2 seconds left in regulation. Dallas (5-5) rallied from a 13-0 halftime deficit and went ahead 17-13 on Romo's 28-yard pass to Dez Bryant. A fumble by Browns rookie Brandon Weeden on a sack appeared to put the Cowboys in control, but Romo gave it right back with a fumble on another sack. The Cowboys made one goal-line stand in the final minutes, but the Browns got another chance and went ahead 20-17 on Weeden's 17-yard pass to Benjamin Watson. (CHARLOTTE, N.C.) Josh Freeman threw a 15-yard touchdown pass to Dallas Clark in overtime to cap a comeback. It was Freeman's third touchdown pass of the game for the Buccaneers (6-4). Carolina appeared to have the game in hand after a 29-yard touchdown pass from Cam Newton to Brandon LaFell put the Panthers (2-8) up 21-10 with 4:34 left in the game. But after a 40-yard field goal by Connor Barth, the Panthers were forced to punt, and Freeman led the Bucs 80 yards on seven plays in 50 seconds with no timeouts. He finished the drive with a 24-yard touchdown pass to Vincent Jackson between three defenders with 12 seconds left. Freeman went back to Jackson for a 2-point conversion on a slant route to send the game into overtime. (PITTSBURGH) Jacoby Jones returned a punt for a touchdown, Justin Tucker kicked two field goals and Baltimore took control of the AFC North with a victory over Pittsburgh Sunday night. The Ravens (8-2) moved two games in front of the Steelers (6-4) by shutting down Pittsburgh's offense, which sputtered without injured quarterback Ben Roethlisberger. Byron Leftwich, making his first start in more than three years, completed 18 of 39 passes for 201 yards and an interception. He ran for a score but was also sacked three times. Baltimore's Joe Flacco wasn't much better, completing 20 of 32 passes for 164 yards, but the Ravens didn't need Flacco to dominate to beat the Steelers for the third straight time at Heinz Field. (FOXBOROUGH, Mass.) The Patriots used three scoring passes from Tom Brady, two touchdowns on interception returns and another on a punt return to match a team single-game scoring record. he first matchup between three-time Super Bowl winner Brady and star rookie Andrew Luck was no match. The Patriots (7-3) won their fourth straight game and extended their lead in the AFC East to three games. The Colts (6-4) had their four-game winning streak stopped by the NFL's best offense and one of its worst defenses. This win was the Patriots' most complete in a season in which they've averaged 35.8 points per game and lost their three games by a combined margin of four points. The 59 points equals the team mark set in a 59-0 win over the Tennessee Titans on Oct. 18, 2009. (OAKLAND, Calif.) Drew Brees threw three touchdown passes and Malcolm Jenkins returned an interception for another score to get the Saints back to .500. Lance Moore caught two touchdown passes and Mark Ingram ran for a score as the Saints (5-5) won for the fifth time in six games and are in position to make a late-season playoff run despite the season-long distraction from the bounty scandal. The Raiders (3-7) lost their third straight game under first-year coach Dennis Allen as their banged-up defense got picked apart by Brees' precision passing. Oakland has allowed 135 points in those defeats, the most in a three-game span for the franchise since allowing 141 in the first three games in 1961. Brees finished 20 for 27 for 219 yards, extending his own records by throwing a touchdown in his 53rd straight game and completing 20 passes for the 46th straight game. (DENVER) Peyton Manning threw for three touchdowns and Von Miller had three sacks to take the league lead with 13. Denver took a three-game lead in the AFC West by sweeping the Chargers. Manning threw for 270 yards. He got off to a slow start, throwing an interception that Eric Weddle returned for a score and an early 7-0 lead. But the Broncos (7-3) took a 10-7 lead early in the second quarter and never trailed again. Manning won his 148th regular-season game as a starting quarterback, tying John Elway for second on the all-time list. Brett Favre has 186. (LANDOVER, Md.) Robert Griffin III threw four touchdown passes, and Washington broke a three-game losing streak. Griffin completed 14 of 15 passes for 200 yards and also ran 11 times for 85 yards. He threw for scores of 6, 49, 61 and 17 yards  one in each quarter. Philadelphia's Nick Foles was 21 for 46 for 204 yards in his first NFL start, and his first two series ended with interceptions. Foles was starting in place of Michael Vick, who suffered a concussion in last week's loss to the Dallas Cowboys. The Redskins improved to 4-6. The Eagles (3-7) have dropped six straight, accelerating the countdown toward the possible end of Andy Reid's 14-year tenure as coach. (ST. LOUIS) Mark Sanchez directed a turnover-free offense and Bilal Powell ran for the first two touchdowns of his career as the Jets ended a three-game losing streak. Chaz Schilens scored on a 25-yard reception and Nick Folk kicked a pair of 51-yard field goals for the Jets (4-6), who were outscored 58-16 the previous two games. The Jets overcame a controversial practice week with several anonymous players quoted in a newspaper report disparaging the ability of backup quarterback Tim Tebow, who had a handful of snaps but was no factor. Brandon Gibson caught a pair of short touchdown passes for the Rams (3-6-1), who committed three turnovers and are in an 0-4-1 slump. St. Louis' defense hasn't forced a turnover in five straight games, tying the NFL's longest such slump since 1950 according to STATS LLC. (KANSAS CITY, Mo.) Andy Dalton threw for 230 yards and accounted for three touchdowns and A.J. Green caught a touchdown pass in his ninth straight game. Green finished with six catches for 91 yards in another dazzling performance, Mohamed Sanu had a scoring grab and BenJarvus Green-Ellis ran for 101 yards and a touchdown as the Bengals (5-5) won their second straight following a four-game losing streak. Cincinnati now plays its next four games against teams with losing records. Jamaal Charles had 87 yards rushing for Kansas City (1-9), but that was the only highlight for a team that lost its seventh straight amid a quiet crowd at Arrowhead Stadium.